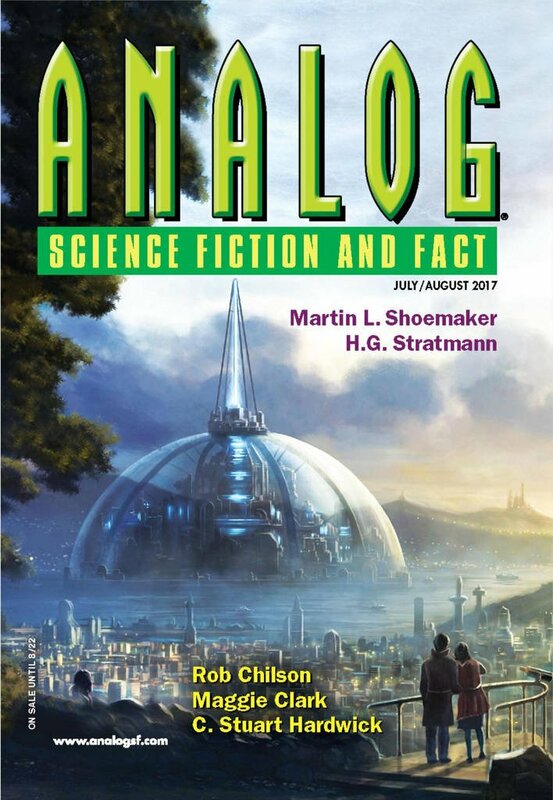 "Often and Silently We Come," by Ron Collins [bio] (edited by Trevor Quachri), appeared in Analog Science Fiction and Fact issue 07-08|17, published on June 15, 2017 by Penny Publications. Pro: The concept is a cool one, and it’s suitably chilling as we gradually realize what a monstrous thing X-jin and his people are doing to the intelligent life forms they study. They appear to be an electronic life form created by a long-vanished race, and the idea that they’re trying to find their creator is interesting too. Con: It breaks disbelief too many times and too many ways. The author tosses in words like “positrons” and “muon pairs” in ways that make no sense, speaks of logic “eroding,” and talks about how all alien creatures express grief by weeping the same way human beings do.